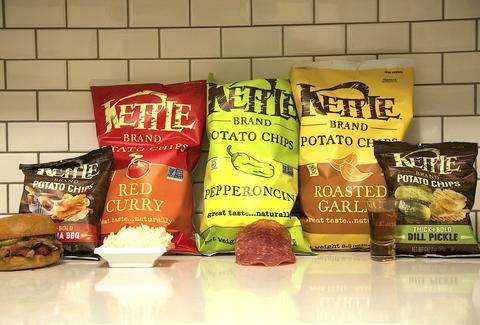 Any time Kettle Chips drops a new flavor, it's cause for snacking celebration (what up, Cheddar Beer?!). Now, the brand has dropped its most interesting-sounding flavors in a while: Red Curry, Dill Pickle, Carolina BBQ, Roasted Garlic, and Pepperoncini. But how do they hold up? And more importantly, how do they pair with the foods that go best with their flavors? 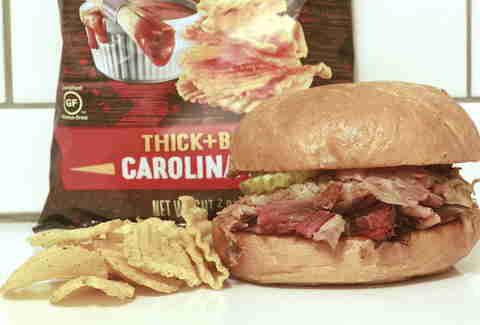 First Impressions: As a guy who loves BBQ but hates BBQ sauce, this is a wonderful change of pace in a chip market reeking of KC Masterpiece. The vinegar and sugar notes are nicely balanced, making for a wholly unique chip. Oh, and they’re part of the new, extra-crispy “Thick + Bold” line of chips, named, presumably, for what I’m going to be after housing a few bags. Paired with pulled pork: Look, you could put a bunch of bleach-soaked shards of glass on a pulled-pork sandwich and it would be good. Luckily, these aren’t broken glass, and thus pair perfectly with their namesake BBQ style. First impressions: These chips give that nice curry kick, but it’s not overly aggressive... unless you start cramming them in your mouth as if somebody's going to take them away from you if you stop. That said, Kettle has created something previously unheard of: a bag of chips that benefits from being eaten slowly and savored. Paired with white rice: Logic might dictate that this would go really, really well with currywurst, since chips and sausage are like peanut butter and jelly. But logic is wrong. Because that’s too much curry. And also because there is no currywurst near my house. The white rice -- curry’s best friend in all Thai restaurants -- does a nice job of mellowing the flavors. Yep. 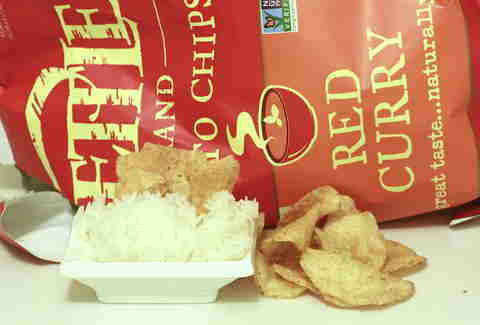 I’m recommending chips crushed up in rice. First impressions: I’m not gonna lie. I was pretty scared of these, mainly because I get heartburn whenever I even think of peppers. Luckily, these are extremely mild, packing the flavor of an Italian sub’s best friend but not the bite. While this might be disappointing to some folks, it gives me a chance to taste something I usually have to pass on, and to be honest, this is all about me. 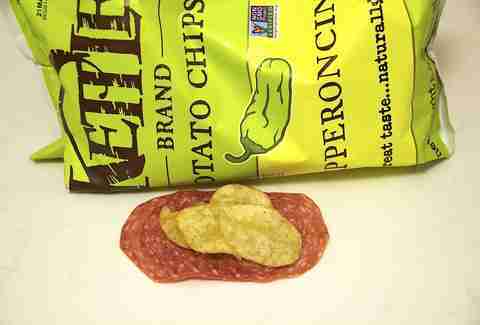 Paired with salami: Since these kind of taste like a mellower version of the juice from a pepperoncini, this is a perfect pairing for people who love the flavor but can’t take the heat. And if you love the heat, I’d recommend plating these underneath your sandwich so they can catch all the dripping pepper juice and adopt a stronger kick. First impressions: Yep. These taste a lot like pickles. Which is to say, if you like pickles, these are going to be your jam. If you don’t like pickles, you already stopped reading this one. 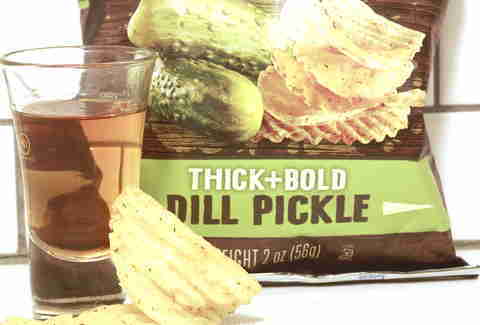 Paired with cheap whiskey: The pickleback is a thing of beauty, but since these aren’t a straight shot of concentrated juice, I’m sorry to report that eating a chip as a chaser to crappy whiskey doesn’t work. Also, you’ll probably choke if you’re dumb enough to actually try it. I sure did/am! First impressions: Holy crap are these things garlicky, like, clear-out-an-entire-room-of-Twilight fans garlicky. This is a good thing, because I love garlic and hate Taylor Lautner movies (except Abduction... that flick's tight). But they're also pretty damn pungent. My wife smelled them from her office... upstairs from where I was eating them. Paired with an attempted make-out sesh: Nope. Not happening. For a while. Andy Kryza is a senior editor on Thrillist's National Food & Drink team, and would pair watching T-Lauts in Abduction with damn near anything. Follow him to enraged Hot Topic employees via @apkryza.